A month after the brutal attack on Andrey Rudomakha, the leader of Environmental Watch on the North Caucasus (EWNC), the Ministry of Internal Affairs in Krasnodar region informed Crude Accountability that the criminal case was taken under special control. The message came in response to our demand to investigate the crime and bring all the perpetrators to justice. Our letter was supported and signed by 307 representatives of international organizations and activists from all around the world. According to the reply, “the quality and timeliness of the investigation are guaranteed”. We will monitor the results of the investigation to ensure that the criminals will be sentenced. In January 2018, we also received notices that our appeals have been accepted for consideration by the General Prosecutor’s Office, the Ministry of Internal Affairs of the Russian Federation, the Administration of the Krasnodar Territory and the Russian President. 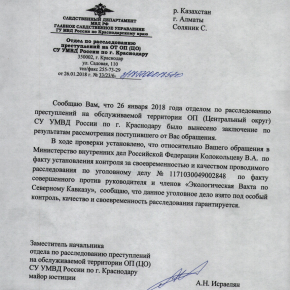 The Ministry of Foreign Affairs informed us that our appeal was forwarded to the Ministry of Internal Affairs. Over three hundred representatives of global civil society signed a letter demanding that the government conduct a swift and full investigation into the violent attack on Andrey Rudomakha and other members of EWNC and bring the perpetrators to justice. In the late evening of December 28, 2017, Andrey Rudomakha, an environmental and human rights defender from Krasnodar, Russia, was brutally attacked as he returned from an environmental inspection documenting corruption and environmental violations on the Black Sea coast. Rudomakha, the leader of Environmental Watch on the North Caucasus, was severely beaten by three men who were waiting for him and his colleagues as they exited their vehicle at approximately 10:20 PM in Krasnodar. According to members of the organization, Andrey was beaten and kicked in the face and lost consciousness. Another member of the organization, Viktor Chirikov, was punched in the stomach, and a third member was sprayed with pepper spray. The attackers also stole equipment from the vehicle, including cameras and computers. The attackers were wearing balaclavas and disappeared quickly after the attack. Rudomakha was taken to the hospital by ambulance and is currently undergoing treatment. He has a broken nose and a fractured skull and is suffering from a concussion. This is not the first time that EWNC has been the victim of a violent attack. In April 2017, the organization’s office was broken into and ransacked, and equipment was stolen. In September 2016, members of EWNC and Greenpeace Russia were violently attacked on private property in the middle of the night during a volunteer fire-brigade training. EWNC has also been included in the “foreign agents” list and has been the subject of numerous administrative and criminal lawsuits that are designed to stop them from engaging in their environmental work. Since 2010, over 70 violations against EWNC have been documented, including numerous physical attacks against members of the organization. EWNC is an environmental organization that works throughout the North Caucasus region, and Andrey Rudomakha is its founder and leader. The group was founded in the 1990s and has worked to protect the environment and local communities throughout the North Caucasus region of Russia. EWNC was instrumental in leading the public campaign against the environmental violations associated with the Sochi Olympics, and its members have been routinely persecuted for that and other environmental campaigning.